First Line: I still see the bed-- its wide white expanse floating like a snowy island on the deep pearly carpet-- the creamy tufted silk coverlet neatly folded back-- the soft heaped pillows, their pale lace soaked and stiff with her blood. The Appalachian Mountains to the west of Asheville, North Carolina, are a mix of old and new: people who have lived there for generations, newcomers who've moved in, artists, New Age devotees, old farms, and new businesses. Over twenty years ago, Elizabeth Goodweather and her husband bought Full Circle Farm, eventually turning it into an organic herb and flower farm. Elizabeth moves easily between the worlds of Asheville and the old-timers who live back in their hollows. She's been a widow for six years, and only recently has she found her interest piqued in another man. Although the farm takes most of her time, Elizabeth finds the ladies at the library to be very persuasive. Before she knows what's happening, she's agreed to round up quilts for an exhibit, and she finds the history behind one of them to be fascinating. At the same time, her youngest daughter talks her into attending performance art done by three young neighbors who live across the road from Full Circle Farm. 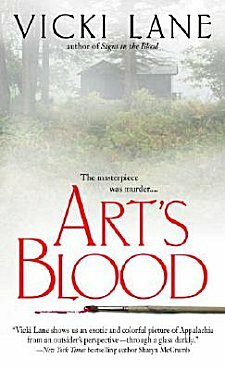 When one of the young artists is murdered, Elizabeth finds herself caught between two mysteries: the true story behind a beautiful quilt-- and of murder. Once again I've fallen under the spell of the world and of the characters that Vicki Lane has created. Elizabeth's the type of character I could easily call friend, and I like to "watch" her do her chores around the farm. She's level-headed, intelligent, kind, and not prone to being a clothes horse. And any time Elizabeth wants to visit octogenarian Miss Birdie on her nearby farm, I'd definitely want to tag along. Miss Birdie may be an old mountain woman, but there's a lot about her that reminds me of those sharp-as-a-tack eightysomethings I grew up amongst in small town central Illinois. Art's Blood fully explores the corrosive theme of jealousy with two major plot lines. One story takes place in the 1930s and focuses on the people involved in the making of a wonderful quilt. Through journal entries written by one of the survivors of those days, we see how the seeds of disaster were planted. The second plot line involves Kyra, a beautiful young artist living across the road from Full Circle Farm. Traumatized as a child, she is very fragile, very mercurial-- and her family is very protective of her. Elizabeth's nephew, Ben, becomes infatuated with Kyra, as Elizabeth's daughter, Laurel, draws her mother deeper into the art world in Asheville. As the story progresses, the two threads begin to weave together into a tale that is tragic, haunting, deadly.... Nothing good ever comes of jealousy. If you enjoy reading books that give you a chance to become well acquainted with the setting, the history, and an excellent cast of characters as well as telling tales that persuade you to keep reading into the wee hours of the morning, there's only one thing you can do: pick up a Full Circle Farm mystery by Vicki Lane. Art's Blood at The Book Depository. Art's Blood at Your Favorite Indie Bookseller. Yes, I've had the privilege of reading The Day of Small Things. I love Miss Birdie! I've loved every one of Vicki Lane's books. I stumbled across the first one last summer and liked it so much that I immediately ordered and read all the others. Even though it's been less than a year since I first discovered the Elizabeth Goodweather series, I've found myself missing Elizabeth lately and may have to reread all of them again soon. Don't you love finding a series that you can feel that way about? Thanks so much for stopping by! I wandered over to A One-Pic Pony, and now I'm going back to enjoy more of your photographs! Thanks, Linda! So glad that Elizabeth feels like a friend!